My name is Jaime and I have a bread machine addiction. Just throw all of the ingredients in and within 2-4 hours you have fresh bread and a fabulous smelling house! Who invented this miraculous machine? My Oster ranks way up there on the "kitchen appliance love scale." Right alongside the keurig and my all clad slow cooker. My kids love those frozen french toast sticks in a box. By the time I get to the freezer section at the grocery store my children have beaten me down enough to ask for anything knowing full well I will give in just to make it peacefully through the checkout line. I bought them once during one of these moments of weakness. Before I tossed them into my freezer I quickly scanned the ingredient list and was disgusted when I saw that the second ingredient was high fructose corn syrup. The next was partially hydrogenated soy bean oil. Yum. 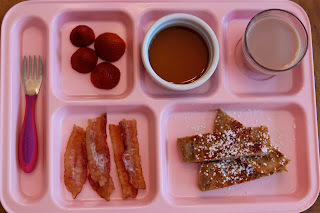 I came up with this recipe to appease my little ones and toast them up some delicious french toast sticks in the morning. The recipe makes about 40 french toast sticks. I freeze them in a ziploc bag and toast them in the toaster oven at breakfast. If you are going to be out all day just set your delay timer on the bread machine! Combine eggs, vanilla, and cinnamon in a bowl big enough for bread slices. Whisk well. Heat a skillet or griddle over medium high heat. Add some butter to heated skillet. Dunk each slice of bread into the milk/egg mixture and cook on skillet until both sides are brown and toasty! Let them cool and cut each slice into 4 or 5 "sticks." There you have it! Homemade breakfast for a few weeks (or a few days in my house). Here is a similar bread machine to the one I have. Mine is old..couldn't find the link! This one has the same features though. Love this idea! I do not like to buy the frozen premade version and my kids would love to wake up to these. And the trays are fun too. 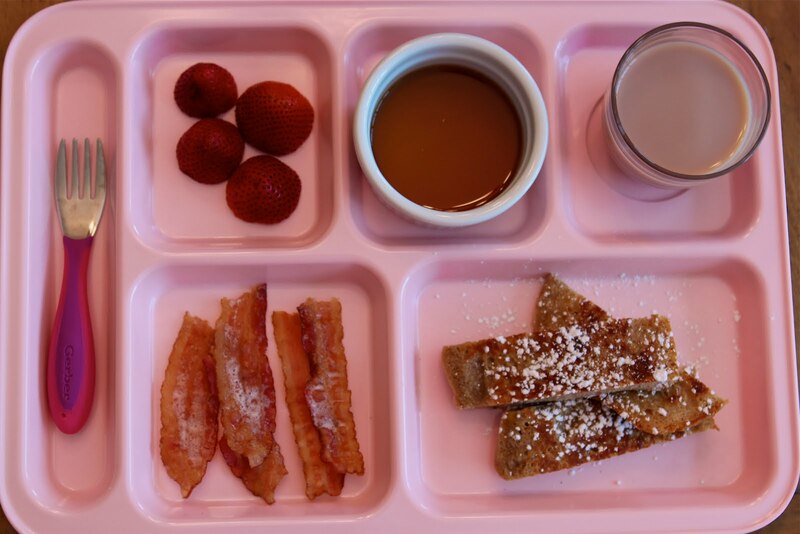 great job making your own french toast sticks!! my girls love them! Copyright © PrepAhead and Dine In: freezable french toast sticks with homemade cinnamon bread. All Rights Reserved.